INSTRUCTIONS: Registration is required. Please bring registration ticket for entry. This Summit has reached capacity and registration is closed. Global Crisis - Georgia Consular Corps. 1:50 p.m. - 1:55 p.m.
3:35 p.m. - 4 p.m.
On Monday, March 11, 2019, Hartsfield-Jackson Atlanta International Airport will marshal the power of community to address the formidable issue of forced labor in Atlanta. The ATL End Human Trafficking Summit is a collective action to bring an end to this blight on society. Join us during Human Trafficking Awareness Month for a day of sessions with experts and a powerhouse luncheon. You’ll leave inspired to make a difference for our most vulnerable victims. Let’s put an end to human trafficking for good. Special guests to include the following award-winning journalists: Chris Hansen, host of “To Catch a Predator;” Channel 2 Action News Anchor Jovita Moore (WSB-TV); Rose Scott, host of “Closer Look with Rose Scott” (90.1 FM – WABE Radio); Channel 2 Action News Reporter Mark Winne (WSB-TV); CBS46 Reporter Meghan Packer (WGCL-TV); and Atlanta Journal-Constitution Columnist Gracie Bonds Staples. Also joining us will be Airport General Manager John Selden, Atlanta's senior human trafficking fellow Ouleye Warnock, Airline Ambassadors International and Polaris representatives, elected officials, law enforcement, human trafficking survivors, and various leaders from a cross-section of industries on the front lines of the human trafficking battle. Special educational performance by The Positive Arts Movement, Inc. Registration opens at 8 a.m. and program begins promptly at 9 a.m. Please bring registration ticket for entry. Walk-ins will not be admitted. GICC parking is available for a reduced rate of $5. For more information, visit www.endhumantraffickingatl.org. Registration is required. Please bring registration ticket for entry. Due to a winter storm warning on Tuesday, January 29, all City of Atlanta and State of Georgia government offices were closed, and this summit was postponed. 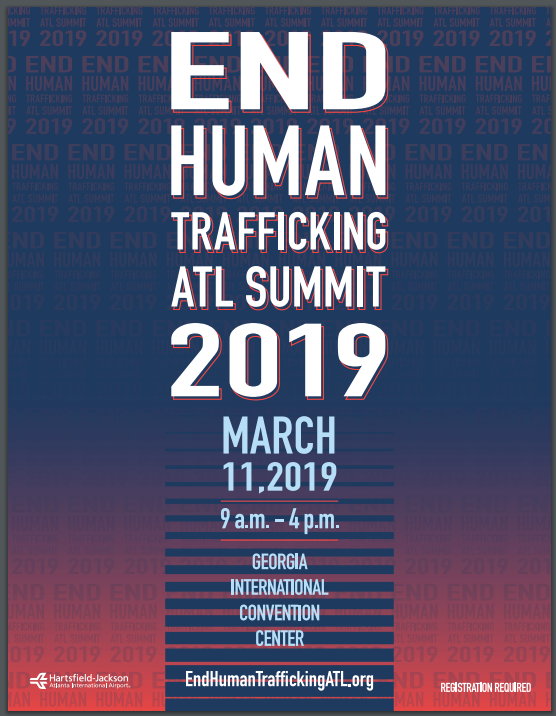 The new date for the End Human Trafficking ATL Summit is: Monday, March 11, 2019. The location remains the same. All 620 registrants must re-register via this link. Therefore, those that did not register before have another opportunity to do so before we reach full capacity. NOTE: CAPACITY HAS BEEN REACHED AND REGISTRATION IS NOW CLOSED. Thank you for your partnership, and we hope that you will join us.